Cover crops and SCN: What's the connection? Iowa farmers are using cover crops for erosion control and soil nutrient and pest management in their fields. There are two aspects of cover crops that relate to the biology and management of the soybean cyst nematode (SCN). Are cover crops inadvertent hosts to SCN? The most immediate point of interest about cover crops and SCN is whether the cover crop plants can serve as inadvertent hosts for the nematode. Of greatest concern would be leguminous plants used as cover crops because there are almost 100 different legume species reported in the scientific literature to be hosts (support reproduction) of SCN. In the past several months, two greenhouse experiments were conducted at Iowa State University to determine if common legume species used as cover crops supported reproduction of SCN. Berseem clover, cowpea, crimson clover, red clover (three different varieties), sweet clover, white clover (two different varieties), Austrian winter peas, and field peas were grown in soil infested with SCN collected from a field in north central Iowa or one in southeast Iowa. The seeds of most of the cover crop plants were provided by Cover Crop Solutions, LLC. After growing in the SCN-infested soils for 30 days, SCN reproduction was assessed by carefully observing the roots of each plant for the presence of adult SCN females. Almost no SCN reproduction occurred on the six to 12 replicate plants of each of the cover crop plants tested in the two experiments. The results of these experiments indicate that these legumes should not serve as inadvertent hosts for SCN if used as cover crops. Can cover crops reduce SCN numbers? There are several reports of cover crops reducing plant-parasitic nematode population densities, including some reports mentioning reduction in SCN numbers. Farmers and agronomists are asking if cover crops can be used to reduce SCN population densities in Iowa. 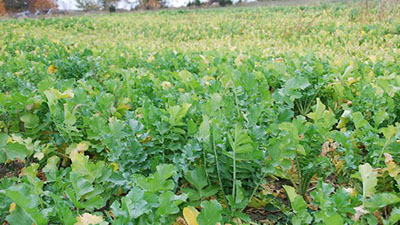 It is biologically possible that cover crops may reduce nematode numbers, particularly for cruciferous plants including cabbage, rapeseed, mustards and radishes. The green leaf tissues of these plants contain compounds called glucosinolates. When the plant tissues are incorporated in the soil, the glucosinolates can be broken down enzymatically to produce nematicidal thiocyanate and isothiocyanate gas. The extent to which this phenomenon can reduce SCN egg population densities in infested fields in Iowa is not known at this time. Another nematode-suppressing aspect of cover crops being discussed is the potential for the plants to serve as a "trap crop" for SCN. Numerous nematode juveniles enter the roots of trap crops, but the juveniles are unable to feed and reproduce once inside, thereby starving in place within the roots. The most well known example of a plant serving as a trap crop for plant-parasitic nematodes is French marigold and the root-knot nematode. To date there are no published scientific reports demonstrating that cover crops serve as trap crops for SCN. A third mechanism by which cover crops have been described as reducing SCN numbers is by the roots producing compounds that stimulate SCN eggs to hatch. The hatched SCN juveniles then would starve due to the absence of actively growing soybean roots upon which to feed. There is no evidence currently that such a phenomenon occurs with SCN and cover crops. Cover crops may reduce nematode population densities as an added benefit. But the magnitude and consistency of the effects on SCN has yet to be demonstrated. And the effect of the cover crop will vary greatly depending on the type of crop being grown and may vary among varieties of a plant within a crop type. Photo 1. A field of tillage radish near Mechanicsville, IA. Photo courtesy Rod Swoboda. Greg Tylka is a professor with extension and research responsibilities in management of plant-parasitic nematodes in the Department of Plant Pathology and Microbiology at Iowa State University. He can be reached at gltylka@iastate.edu or 515-294-3021. Links to this article are strongly encouraged, and this article may be republished without further permission if published as written and if credit is given to the author, Integrated Crop Management News, and Iowa State University Extension and Outreach. If this article is to be used in any other manner, permission from the author is required. This article was originally published on September 25, 2014. The information contained within may not be the most current and accurate depending on when it is accessed.